Do You Have Assets or Liabilities? For years, I’ve been spending my money and time acquiring things which I believe an asset. I guess most of the populations are also doing the same, busy acquiring things which they think as an asset and could make a very good investment. All this have changed after I read books by Robert Kiyosaki, the famous author of books Rich Dad Poor Dad and Cashflow Quadrant. 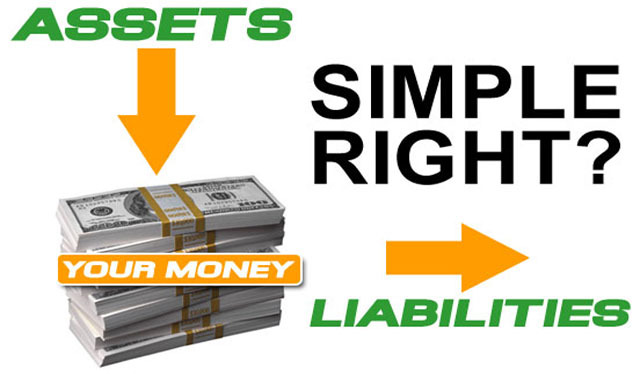 I began to realize the mistakes and misconceptions about asset and liabilities. My mind was opened to the world of big possibilities and endless opportunities. Asset, as described by Mr. Kiyosaki on his book, is something that produces income. It may be a house, car, real estate or anything, as long as it gives your revenue. Liabilities on the other hand, is something that when we acquire, it continue to take up portion of our money. It may be due to maintenance, monthly dues, or whatever reason that we are paying for that thing. The explanation was quite simple and straightforward, but when you analyze it, you will learn the great mistakes most people are doing. Then I began to analyze everything that I have acquired in the past few years. And guess what, I am a foolish guy acquiring liabilities but thinking it as an asset. Is your house an asset? If someone is renting on it and gives you monthly income, then it is. But if it’s something that never gives you any money, it’s a liability. Plus the fact that you also pay maintenance and other bills to keep the house in good condition. Is your car an asset? Unless you use it as taxi that earns income everyday, it is never an asset. It’s a big liability where you have to pay for all the maintenance and high price of gasoline. Is your land an asset? Unless your land has something in it that gives you extra income, it’s a liability. Who will pay for the taxes of that property? The answer is you, taking your savings to pay the taxes. Is my condo a good investment asset? Same with your house. If somebody is renting it, then it’s a very good asset that can give you passive income. But if not, it’s a big liability. Who will pay the monthly association dues and yearly taxes and insurance? And the list goes on. You may also try asking yourself what you have right now and see if it’s an asset or liabilities. Most of the people are well educated technically, especially on the field of our expertise. We are a very good employee that makes our company grow bigger and richer. But in the end, all we want is to have a financial and time freedom to enjoy life. The big question now is, what are you doing to achieve those dreams? The only way to get out of this so called Rat Race is start acquiring assets that could give you extra earnings passively. And when the time came that you have enough passive income, you can now retire and focus with your financial and time freedom. This is how things should work if we want to enjoy life to it’s fullest. Most of the people are not going to that direction; they just usually follow the crowd. Unfortunately, those who follow the crowd usually get lost. The first step is to understand how money works and how to make money work for you. Not you working for money like most of us are doing. Start empowering yourself and invest on education. Five years from now, can you see any significant changes that might happen along the way that can change your life? If none, you better start thinking about it. Join us in playing Cashflow Quadrant to better teach you financial literacy.